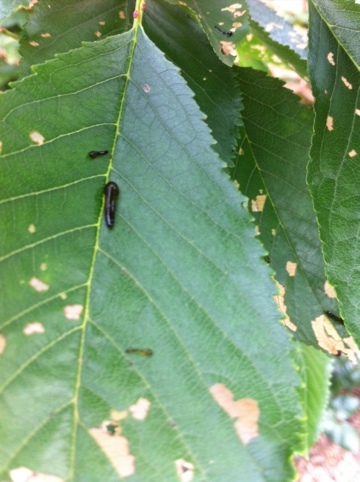 Judging from the number of slugs on my cherry tree and from the number of visitors to my blog looking for answers this has been a bad year for cherry and pear slugs. For those who aren’t familiar with it, they are a small black slug between a few millimetres and 2 cm long that feed on the leaves of cherries and pears. If you have leaves on your tree that end up looking like lace, then you probably have cherry slugs. If a post last year I talked about using wood ash as a dusting to controls the slugs. You can use pyrethrum spray but that kills the good insects as well as the bad, so this year I took my own advice and went for the wood ash. Initially it looked good but the devils kept coming. I was almost going to give up and reach for the bottle (of spray that is, not alcohol!) 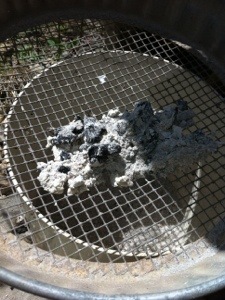 but I persevered with the ash but it seems to have worked. continue reading..
Pear and cherry slug is a common problem in my area, mainly due to the fact that this was a fruit growing area of Melbourne which has left the area with an endemic problem of fruit tree pests. Pear and cherry slug control is a task that I have grappled with ever since I put my cherry tree in a few years ago. Initially I wasn’t familiar with the problem but as the leaves on my cherry tree were gradually reduced to skeletons I knew that I had an issue. A bit of research revealed that it was pear and cherry slug and I quickly deduced that some sort of control was going to be necessary. A quick spray with pyrethrum spray seemed to sort the devils out. The pear and cherry slug is the larvae of the sawfly. The adult sawfly lay their eggs on the leaves of the cherry or pear tree which then hatch to for the slugs. The slugs proceed to eat the leaves of the tree, producing the distinctive lace like pattern that is indicative of the problem. On a closer look you will see the small black slugs on the leaf. Once the slug has reached maturity it will drop to the ground and pupate. After it completes that process it will emerge to fly back up to the leaves of the tree to lay its eggs. There are two lifecycles a season, so that is why pear and cherry slug control is important, otherwise the second, heavier wave can really decimate an already weakened tree. continue reading..